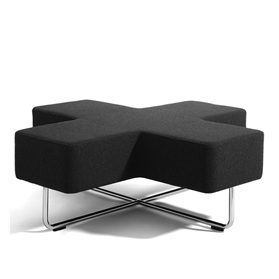 Designed by John Coleman Allermuir Jaks works equally alone or in groups with its fun shapes interlocked and configured into exciting playful, tessellated patterns due to its distinctive, graphic 'Cross' shape. It's a simple form and construction that economically provides seating for up to 4 people. Jaks facilitates meeting and greeting informal spaces, or a comfortable seat for those who just want to take a break whilst also having somewhere to just perch their laptop for a while.